Many visitors to Zion National Park are directed to Zion Canyon and never get the chance experience some of the special surprises hidden on the east side of the park. While Zion Canyon offers a somewhat limited opportunity to explore, the east side is a wide open wilderness providing a large range from extreme hikes to outstanding tidbits that require minimal effort. There are many short canyons to explore in this area, including this short north-south running canyon located on the west side of the small tunnel, which is 1.5 miles east of the 1.1 mile long Zion-Mt. Carmel Tunnel. Directions - From the parking area on the western side of the small tunnel, simply walk north down the steep embankment to the canyon floor below. Follow the wash as it travels toward the East Rim. The other short canyon you can explore is on the western side of the small. This drainage is a bit more challenging than the first one. The hikes on the east side of the park that have the charming potholes capable of containing water are always better if indeed there is water in the hole. Hiking trails like this just after a rain storm is ideal and these outings make wonderful winter hikes since in the winter there is usually not only water filled potholes, but a cascading water flow where one pot hole after another spills into the one beneath it. In Cascading Falls if you hike at the right time you will be privy to rare glimpses of steep, slickrock falls and glistening pools of emerald waters that are cradled by towering sandstone monoliths. One mile up the wash you will see the potholes disappear to be replaced by a true slot canyon. Travel beyond this point is soon thwarted, yet what so many seek is so easily found - a slot canyon, spectacular views and solitude. Directly across the highway is Clear Creek and the start of the hike to another short slot, Hidden Gardens and on the same side of the road is Tunnel Canyon. Cascading Falls, is off the beaten path and on the east side of Zion. 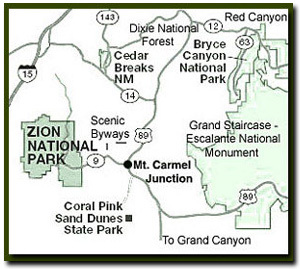 Parking - Parking for Cascading Falls is 1.5 miles east of the Zion-Mt. Carmel Tunnel. There is ample space on both sides of the road for parking just prior to entering the west side of the small tunnel on the Zion-Mt. Carmel Highway.